Regardless of whether you saved Theresa at the start of the game or not (Cavalier trophy) she will still come and rescue you. 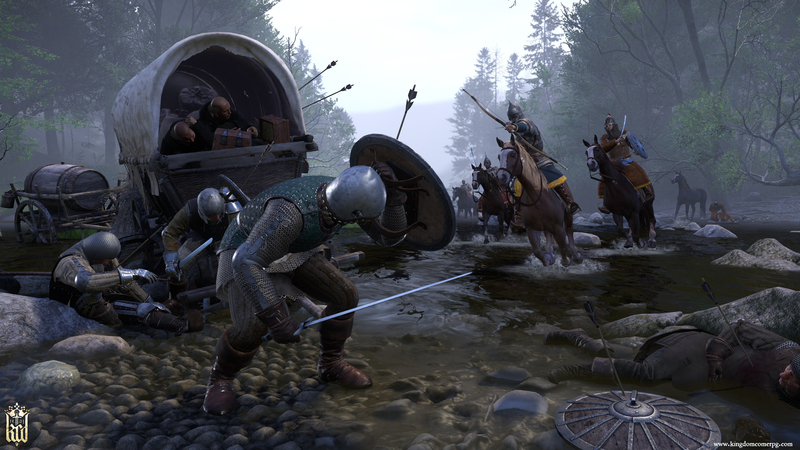 During the main quest 'Keeping the Peace' in Rattay you will have to talk to a guard called 'Nightingale'. Upon speaking to him you will automatically unlock the side quest 'Courtship' in your quest log. Complete this quest to romance Theresa and earn the McLovin trophy at the end of it. There is only one horse armour in the game and to find it you must travel deep into the woods east of Ledetcko until you get to the upper edges of a tall cliffside. If you look below you will see a dead horse in a giant nest which you can reach by jumping on the bushes. Then just loot the nest to get the horse head armour. Remember that the further the freshness level drops towards 0 the more poisoning the food becomes. As a general rule of thumb, avoid eating foods with less than 50 freshness (red value), unless you are standing next to a bed. Rotten food can still be resold so it's not completely useless. Food in the range of 30-50 freshness will give you minor poisoning if you consume it in small quantities which is not be an issue if your health is full. Either sleep in a bed or consume an Antidote Potion which can be bought from apothecary shops (there is one in the town of Rattay). You can also unlock the perk 'Human Dustbin' from the Vitality skill tree (requires Vitality stat at level 6) which will negate ALL food poisoning, even for the most rotten of foods. If you have this perk you will never suffer from food poisoning again. If you sleep in a bed you will gain +10 health per hour slept. Sleeping will also negate food poisoining. Some treasures require a spade, you can find the spade at the Rattay Mill, by a cart in front of the mill. For treasure chests that require hard/very hard lockpicking, you can drink a padfoot potion which will increases your lockpicking by 5 levels for 10 minutes. If you concentrate on the treasure locations that require a spade, easy lockpicks, or no tools at all, you will get around 10,000 Groschen in 2-3 hours. Early in the game if you resell the armour you don't need you will earn a lot Groschen fast which you can use to get the best armour pieces. There is a 'free' bed in the barn about midway on the road between talmberg castle and the woodcutter's camp. You can sleep there all the time you need.